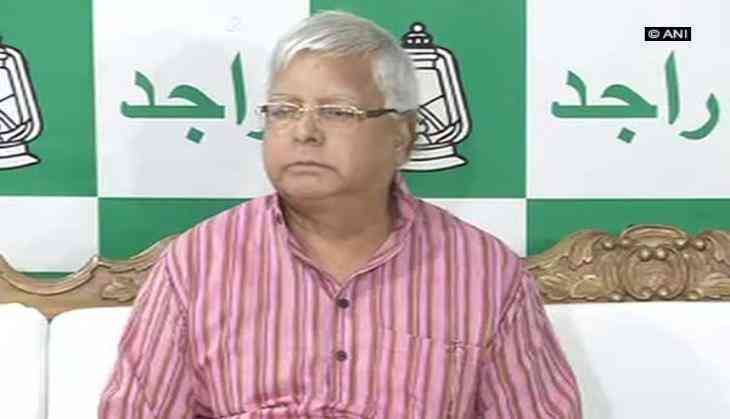 Rashtriya Janata Dal (RJD) chief Lalu Prasad Yadav on 1 August said that Bihar Chief Minister Nitish Kumar had wanted to sacrifice his son Tejashwi Yadav out of sheer insecurity. He claimed that Nitish got alarmed, when people started taking about Tejashwi's good work as deputy chief minister. "We supported Nitish Kumar, but when people started talking about my son Tejashwi's work, he got alarmed out of insecurity and wanted to sacrifice him," said Lalu. He also accused Nitish of being on Bharatiya Janata Party's (BJP) side from the very beginning of their alliance. "Nitish has declared that no one can challenge Prime Minister Narendra Modi in 2019 Lok Sabha polls. This shows he was with the BJP from the beginning of 'mahagathbandhan'." Lalu said. He also mentioned that, "Once Sharad Yadav had put his life on stake in an election campaign against me for Nitish." Further lashing out at Nitish, Lalu stated that only because of Mulayam Singh, he allowed the Chief Minister in his alliance. "Yesterday when he accused me and my family; I knew it was coming, as he is not a man of his words. He has also forgotten the day when I made him rule the state and join my alliance with open arms. It was only because of Mulayam Singh that I agreed to accept him in my party. But today I regret of the time spent and the moment lost," he said. Taking a jibe at Prime Minister Narendra Modi, Lalu said that Nitish used to speak ill of BJP and today he is singing his glory. Yesterday Nitish in his first press conference after snapping ties with long time ally RJD had said that if Lalu had explained himself over the corruption allegations, then situation could have been different in Bihar.